For those of you out there that know me well, you know how much I love vampire stories. Yes, I’m one of those people that will probably read/watch something just because it has vampires in it. Do I think vampires are overdone, both in books and film/television? Hell yes. For every good vampire story out there, there’s at least a hundred more that are pieces of crap not well written, and give vampire fiction a bad reputation. So, like many fans, I wade through the endless rivers of pooh, searching for those ever so rare gemstones: good vampire tales. (Not literally, that would be gross.) It was with that in mind, that I sat down to watch Byzantium. Byzantium is a 2013 vampire film directed by Neil Jordan. It stars Gemma Arterton and Saoirse Ronan as mother and daughter vampires living in England and doing what vampires do to get by in a modern world: blending in with the humans. The pair are over two centuries old, and the history of their making is told in a series of flashbacks and as part of an essay that Eleanor (Saoirse Ronan) writes for a boy she befriends. It’s clear that Eleanor is lonely, and tired of keeping her secret. She seems especially tired of her mother, who prostitutes herself (and others) to pay for their upkeep. She doesn’t understand why no one can be told the truth about them, and that is only revealed slowly, through their history. Eleanor and Clara (Gemma Arterton) are opposing forces. Clara is an extrovert, and also extremely cynical and practical. Eleanor is more of a dreamer, an introvert, and always wants to do the right thing. Eleanor acts as a sort of Angel of Death in order to feed, while Clara is more of an Avenging Angel, preying on the undesirables in society. It’s their history, and their relationship, which is really the driving force in the film. While Eleanor and Clara are the central focus, there are other characters that are important in moving the story forward. The boy Eleanor befriends, Frank (Caleb Landry Jones), is someone she sees as a kindred spirit. They have a kind of instant, yet awkward, connection. It’s kind of sweet, in a creepy sort of way. Johnny Lee Miller plays a naval captain that sets Clara on her rather horrific path in life, and Sam Riley plays his friend Darvell, who isn’t present for much of the film, but is certainly is one of the central characters. Also, I’d be remiss if I didn’t mention Tom Hollander playing Eleanor’s teacher at school (because, Tom Hollander!!!). Neil Jordan, the director of Byzantium, is no stranger to vampire films. In fact, he directed one of my favorite vampire flicks of all time, Interview with a Vampire. I’ve seen a few movies Neil Jordan’s directed (The Crying Game, The Brave One, Ondine, and the aforementioned Interview with a Vampire), and I’ve yet to be disappointed. Byzantium, like a lot of Neil Jordan’s movies, takes a while to get going, but once the story catches you, you’re locked in, anticipating how things are going to end up. It’s not quite a hanging-on-the-edge-of-your-seat kind of anticipation; it’s more like a meandering perhaps-I-should-approach-this-with-caution kind of build up. As for the technical aspects, the camera set ups and movements, the cinematography, the lighting, it’s Jordan at his best. Where he places the camera, and how he follows people throughout a shot, this is classic Jordan. If you’re a fan of his directing style, you’d probably enjoy this movie for that alone. The acting is great, especially Saoirse Ronan (I haven’t seen her in something I didn’t like) and Gemma Arterton was completely effective as Clara. Johnny Lee Miller played such a dis-likeable character that I didn’t even recognize him throughout the entire movie. I’m not sure if that’s a good or bad thing. Overall, the film was good, but never quite reached great, although it had that potential. I don’t think anything was deficient in technical aspects, rather it was the story that was lacking in some way. It’s not the fact that they never really explain how they became vampires (despite numerous trips to a mysterious island), because you don’t necessarily need that. There were key parts of the plot that I thought were just…lame (sexist vampire brotherhood!) because they could have been utilized in a more effective way and instead just sort of hung there as ‘this is how it is, don’t ask questions’. I think, for me, it also has a lot to do with the ending. I enjoyed it, truly, and it ended how I wanted it to end, but maybe not how it should have ended. Anyway, it’s both creepier than a lot of vampire films, and leaves you with warm and fuzzies. Not exactly what one would think of a as a winning combination, and yet, it manages. 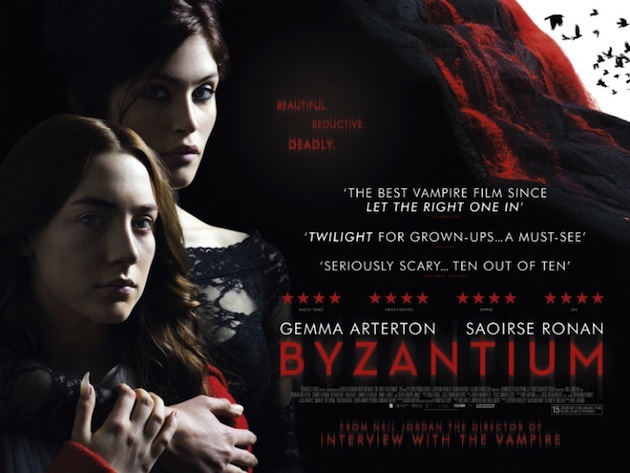 Byzantium isn’t the best vampire film out there, but it’s a far cry from the worst, and definitely worth checking out if you have some free time.